dCloudLauncher is designed for remote support scenarios where transferring your copy of D7 over the remote connection would be far too slow. Cloud Launcher is currently 232k zipped with standard compression, and can be transferred via remote support software with lightning speed. Once dCloudLauncher is on the remote system and executed, it presents you with the above screen, and can download D7 using HTTP from the remote system. The entire process is far faster than attempting to transfer your copy of D7 to the remote system, and can shave off up to 5 minutes of waiting before you can start working on that remote system! Select Config – Choose your preferred D7 configuration set from dCloud to download. Save Config As Default – Saves this configuration and will bring it up by default on the next dCloudLauncher run. Download & Run – This option performs several tasks. First it downloads the very latest D7 version from www.FoolishIT.com and extracts to the D7 subfolder. Next it downloads your most current D7 configuration set from dCloud and places that in the D7 subfolder. Finally, it launches D7. 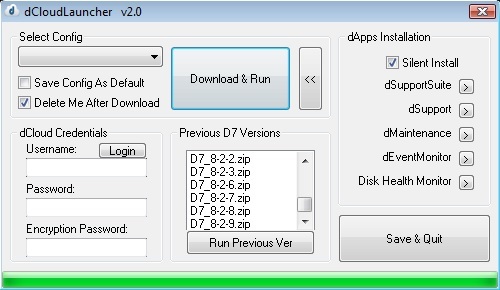 Delete Me After Download – After D7 is downloaded, dCloudLauncher will delete itself and clean up all files used, leaving you only with a freshly downloaded D7 folder containing the latest version and your preferred configuration. >> – Presents the screen below. Also, the first time you run Cloud Launcher, it will present you with the options screen. This provides access to enter your credentials for dCloud, allows you to install other dApps from dCloud, and gives you access to download previous versions of D7 from dCloud, just in case something is working properly with the latest version. dCloudLauncher SFX is a tiny ~280k self-extracting/executing/deleting archive designed to be quickly transferred to the remote system you are working on, which will automatically retrieve the latest d7 version from my website, and your latest d7 configuration set from your dCloud account. You should download dCloudLauncher from within d7’s dCloud interface, where it will create the dCloudLauncher SFX for you!